Elac FS 147 review | What Hi-Fi? 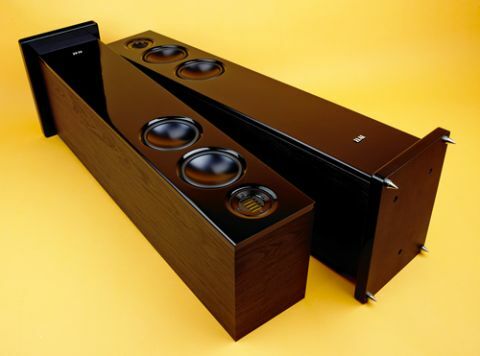 The ELAC FS 147s are the floorstanders in the company’s Line 140 series, which sits somewhere in the middle of the range. They’re siblings to the standmounting BS 142s, which we reviewed last month, judging them to be a touch unsubtle, but fun. It’s clear these speakers come from the same family, because they have similar traits. The FS 147s are great for outright fun, even if they struggle with nuance. The two 14cm mid/bass drivers feature what the company calls ‘Al-sandwich’ – 0.2mm of aluminium foil, glued to a pulp fibre cone to form a sandwich membrane, which is intended to reduce distortions. Each speaker has two rear-firing reflex ports. These are flared at both ends to reduce noise from air turbulence. You get multiple foam bungs, so you can choose just how much you want to block up the ports, depending on where the speakers are positioned. There’s also the JET tweeter, which is what ELAC calls its ribbon tweeters. These speakers look quite nice from the sofa, but close up, less impressive. The build is solid enough, but we’re not too sure about the finish. Most of the cabinet has a black ash finish, with its face made of glossy plastic. When it comes to the FS 147s’ sound, we already said these are a little unsubtle, but fun – and that’s the key thing to know about these speakers. Tonally they have an even-handed approach, with no emphasis on any part of the frequency range. Rhythmic drive and dynamics are quite strong, and there’s liveliness to performance. The level of detail is good, particularly at the top end where the treble is clear and precise. We can’t get away from ‘unsubtle but fun’, though. Let’s start with the fun. The FS 147s have a boundless enthusiasm that we find quite infectious. The sound is bold and energetic, charging along to whatever you play like an excitable puppy. They are definitely good for those who want a big sound for house parties. For nuance, however, you may want to look elsewhere. The bass, for instance, feels oversimplified. If you’re after layers and subtlety to your music, you will struggle to find them here. If you want speakers to pick up every strum or hi-hat, you will be slightly let down. We said it before with the BS 142 standmounters, and we’ll say it again with the FS 147s. These ELACs have a clear sense of purpose – and that’s fun. The FS 147s certainly aren’t for those who want to sit and analyse every part of a record. If you just want to be entertained, however, and you’re not overly fussed about the details, these will serve you well.